Those who read my blog more often know that I like to read “historical” Finance books especially when there is high volitility in the markets. For me this is maybe some sort of “therapy” in order to control my “Buy and sell” finger better….. Anyway, when I read my last historical book, the “Lords of finance”, a historical financier named Ivar Kreuger popped up a couple of times. Coincidently, I found out there is a recent book avaliable from the author Frank Partnoy who also wrote “FIASCO”, a wall street classic. 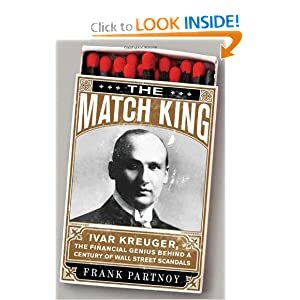 It is the story of Ivan Kreuger, a self-made Swede who made his first money in construction and then moved on and tried to monopolise the international match production in the 1920ies and early 30ies. He soon became one of the most famous business men in the world, having shares of his companies listed on the New York stock exchange and dining with US President Hoover and other head of states. He was a master in taking advantage of the problems after WWI by offering loans to Governments in return for monopolies for match production and imports. As some side activities, he also owned Ericsson, the Swedish telephone company as well as gold mines and other assets. However from his early beginnings he was an absolute master in 2 disciplins: issueing complicated securities including many “derivatives” and creative accounting and transactions between his numerous official and unofficial companies. After the big crash of 1929 he had to do more and more aggresive transactions in order to stabilize his empire before he was finally caught out and shot himself in Paris in 1932. Besides being a really good read, the book clearly shows that nothing is really new in finance. One could even think that the CFOs of companies like Enron or several Chinese Reverse Mergers have used the “Match empire” as a case study. The story of a brilliant guy, impressing everyone but doing one deal too many seems to be one of the constant themes of financial history. Indirectly it is also a lesson not to believe too much in Management, no matter how brilliant it seems, but stick to the hard numbers and facts (Groupon anyone ?). I really liked the book and can recommend it to anyone who is interested in historical finance and large financial scandals. I would subscribe to Greenwald and Philip Fisher. Absolutely. Lefèvre and Baruch were entertaining and historic, but little more in my view. Klarman’s Margin is getting more expensive every year and I couldn’t catch it. Dorsey, the “Cundill”, Marks, Schilit, Partnoy and Einhorn (as a writer) were new to me. To date. Some time ago I was reading about Kreuger in Kaufman’s On Money and Markets: “the largest bankruptcy on record up to that point”. Would you post a book recommendation list of yours?